Griffin Technologies introduced several new iPod accessories at the Apple Expo show in Paris last week. Of most interest to podcasters, is the iTalk Pro. The microphone iPod attachment records in stereo at 44.1 kHz CD-quality sampling. The iTalk Pro comes with twin built-in microphones, but also will let you connect an external mic via a stereo 3.5mm input jack. The iTalk Pro is slated for a Q4 launch. The iTalk Pro works with video iPods and second generation iPod nanos. 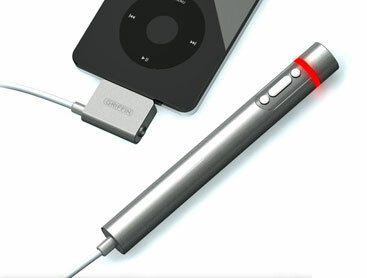 Griffin also introduced the iKaraoke, an accessory that turns any iPod into a portable karaoke machine. The iKaraoke is able to fade out existing vocals in songs, and you can use the included microphone to add your own vocals. An integrated FM transmitter lets you broadcast the result over a home stereo. Great! Finally can retire my old iTalk. I wonder if the new one has a built in speaker as well.